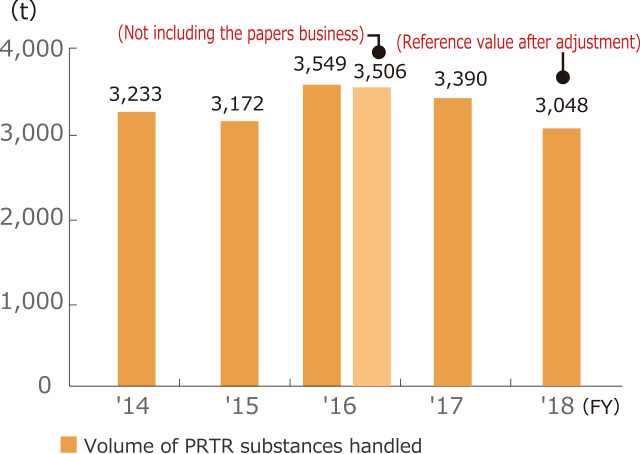 The volume of PRTR substances* handled was 3,390 tons, down 4% year on year due to the transfer of the papers business. Excluding the papers business, the volume of PRTR substances handled dropped 3% year on year. Major items making up the Nisshinbo Group’s volume of PRTR substances handled were antimony (842 tons) and chromium (458 tons) for brake materials, and methylenebis (4,1-phenylene)=diisocyanate (955 tons) for urethane materials. * PRTR substances: Substances subject to the Pollutant Release and Transfer Register (PRTR) system pursuant to the “Act on the Confirmation, etc. of Release Amounts of Specific Chemical Substances in the Environment and Promotion of Improvements to the Management Thereof” and reports of their amounts of release and transfer must be filed. 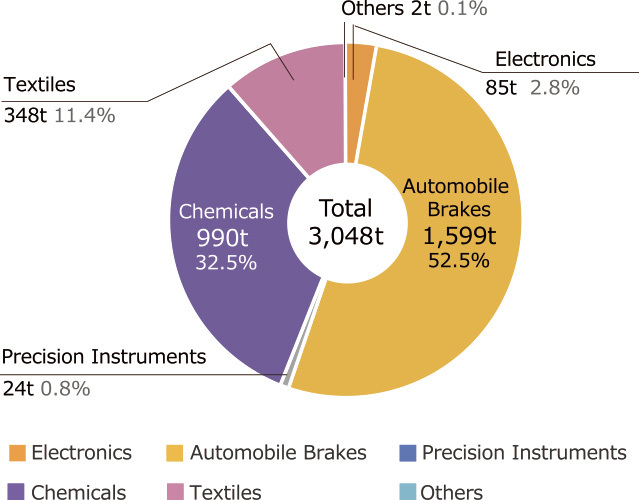 The automobile brakes business accounted for 52% of the overall volume of chemical substances handled by the Group. 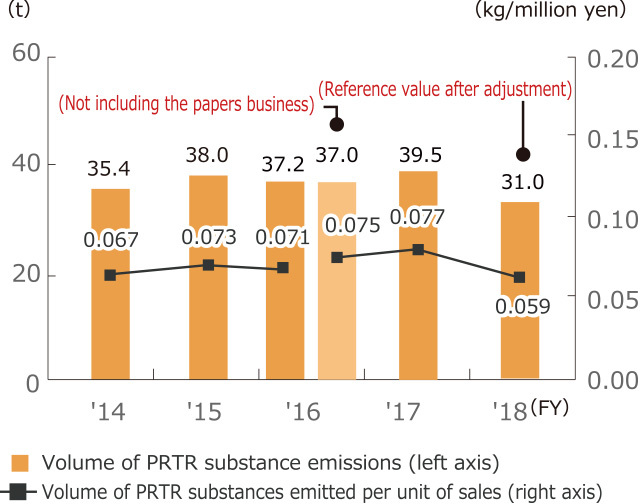 The Nisshinbo Group’s amount of PRTR substances emitted into the environment was 39.5 tons, up 6% from the previous year, while emissions per unit of sales were 0.077 kilograms per million yen, up 8%. Excluding the papers business, the amount of PRTR substance emitted into the environment rose 7% year on year and emissions per unit of sales increased 3%. 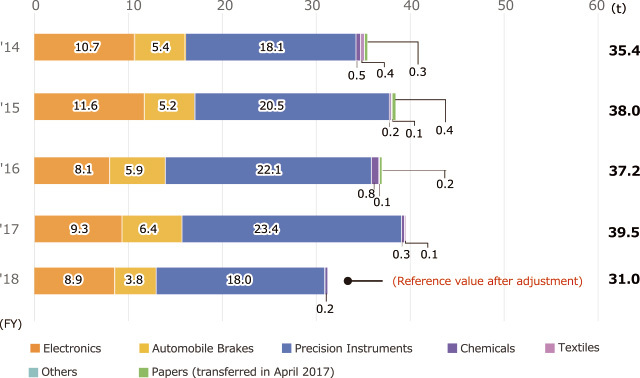 These results were primarily due to increased emissions of toluene and xylene in the precision instruments and electronics businesses. Toluene accounted for the highest proportion of emitted chemical substances, at 46% of the total. By business, the precision instruments business, which emits large quantities of toluene, xylene, and ethylbenzene, accounted for 59% of the total. However, the conversion to dichloromethane alternatives was completed, eliminating emissions in the business. The volume of suspended substances (SSs) in water emitted by the Nisshinbo Group per unit of sales was 0.16 kilograms per million yen, down 43% from the previous year due to the transfer of the papers business. The amount of COD* emissions per unit of sales was 0.28 kilograms per million yen, down 63% year on year. Excluding the papers business, the volume of SSs in water emitted per unit of sales was slightly higher than the previous year’s, while the amount of COD emissions per unit of sales was slightly lower. The Nisshinbo Group’s emissions of sulfuric oxides (SOx) per unit of sales were 0.54 kilograms per million yen, essentially unchanged year on year. 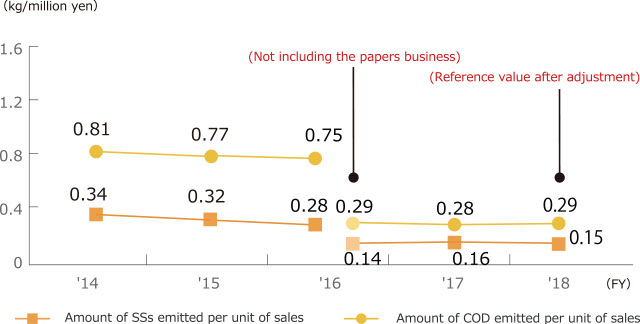 Emissions of nitrogen oxides (NOx) per unit of sales were 0.58 kilograms per million yen, down 5% year on year, while volatile organic compound (VOC*) emissions were 0.17 kilograms per million yen, up 6%. Soot and dust emitted per unit of sales remained mostly unchanged from the previous year, at 0.13 kilograms per million yen. Excluding the papers business, emissions of SOx per unit of sales fell 7%. This was mostly due to THAI NJR CO., LTD. converting its boiler fuel from fuel oil to LPG. 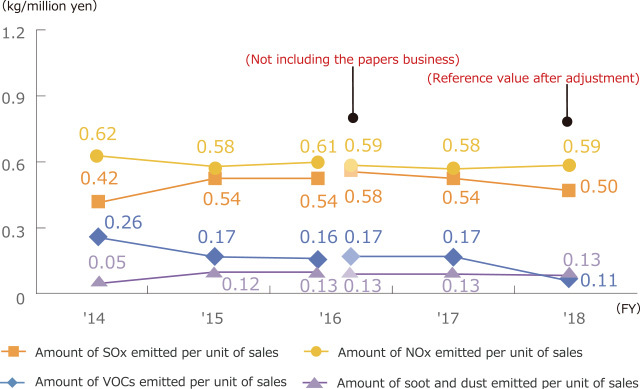 Emissions of NOx per unit of sales decreased 2%, while emissions of VOCs and soot and dust per unit of sales remained mostly unchanged from the previous year. Minute traces of perfluorooctanoate (PFOA), which has been criticized for its environmental persistence and bioaccumulation potential, can be found in fluorine agents used for water repellent finishes on textiles. Nisshinbo Textile Inc. promptly began working on eliminating PFOA from its manufacturing in fiscal 2017, prohibiting its use both in Japan and other countries, and has switched to a PFOA-free manufacturing process.